Front deck rider mowers are convenient and easy to use ride on lawnmowers with improved manoeuvrability versus traditional mid-deck tractors. 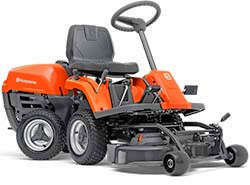 They are ideal lawnmowers for cutting around obstacles, trees, shrubs and flower beds in the garden. Front deck riders are designed to cut the grass before the wheels get a chance to flatted it down, leaving an excellent, even cut throughout the lawn. 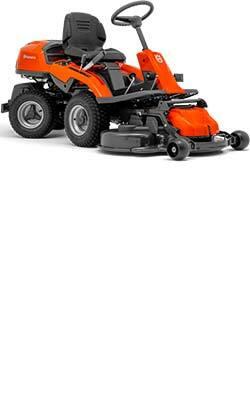 These mowers are the ideal mulching lawn mower. 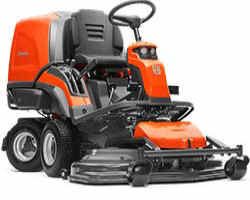 Most models come with 3 cutting blades that leaves an excellent cut and allows the mower to handle rougher gardens with ease. They all come with a wide range of cutting heights and automatic blade engaement that turns on the cutting blades once the deck is lowered into cutting position. We can deliver your new front deck rider to anywhere in Ireland, fully assembled and ready to cut, call us today for a quote. 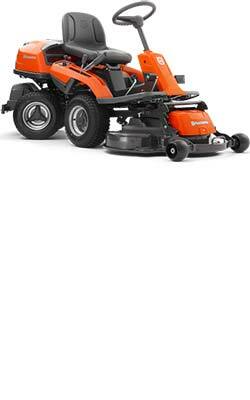 Husqvarna are the market leaders when it comes to front deck rider mowers. 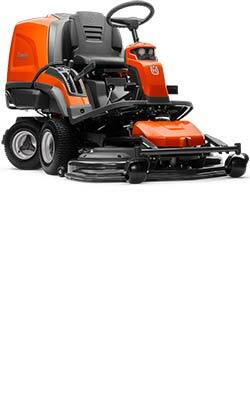 Elegant and sophisticated these mowers are second to none when it comes to design and manufacuring workmanship. With the front-mounted cutting deck and articulated steering, it’s hard to find places where a Husqvarna Rider isn’t able to reach. The combination of control, comfort and efficiency will not only make your work easier — you’ll also enjoy the ride. All ride on mowers use Husqvarna’s patented Bio-Clip® feature which produces a superior mulching result and an exceptional professional finish. 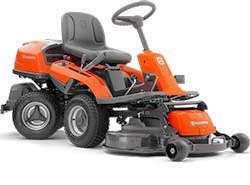 From the R112C with 85cm deck suitable for smaller gardens up to the large R316TXSAWD four wheel drive models that are suitable for large, even hilly lawns. The range covers deck sizes from 85cm up to 112cm and beyond in the 400 series riders up to 122cm deck widths.